ASA Flight 529 left Atlanta (ATL) at 12:23 for a 1 hour and 26 minute flight to Gulfport (GPT). At 12:42 the flight was cleared to climb to FL240. When climbing through FL181, at a speed of 160 knots, the no. 1 engine torque fell from 63% to 0% and a loud thud was heard. The Brasilia rolled left, pitched down and started to descend. With a loud bang, one of the four blades (Hamilton Standard 14RF-9) had separated. The prop couldn't be feathered and an emergency was declared. The aircraft descended at a rate of 1000-2000 ft/min. The Brasilia appeared to be too difficult to control to reach Atlanta. ATC provided flight 529 with vectors to West Georgia Regional Airport. At 12:53 the airspeed steadily decreased from 168 knots to 120 knots IAS. One minute later, the aircraft contacted trees in a 20 degree nose-down attitude and an increasing left-wing-down attitude of 15-40deg. The Embraer flew another 360 feet before crashing into a field. PROBABLE CAUSE: "The in-flight fatigue fracture and separation of a propeller blade resulting in distortion of the left engine nacelle, causing excessive drag, loss of wing lift, and reduced directional control of the airplane. The fracture was caused by a fatigue crack from multiple corrosion pits that were not discovered by Hamilton Standard because of inadequate and ineffective corporate inspection and repair techniques, training, documentation and communication. 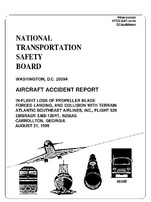 Contributing to the accident was Hamilton Standard's and FAA's failure to require recurrent on-wing ultrasonic inspections for the affected propellers. Contributing to the severity of the accident was the overcast cloud ceiling at the accident site." Distance from Atlanta-William B. Hartsfield International Airport, GA to Gulfport-Biloxi Regional Airport, MS as the crow flies is 563 km (352 miles).